The whitework is taking so much time but I’m really loving the subtle effects. I hope to get all the whitework done soon so I can start on the black lace of the background. There was a big storm yesterday and migraines galore. I’m still plugging through though and managed to make a bit more headway into my Blythe custom. I’ve carved the lips and philtrum. I’ve installed the handpainted eyechips I’ve finished a few days ago. Lacroix is coming along and it’s taking a while but it’s getting there. I’ve already told myself not to go too fast. There is no rush. What are you working on? Are you enjoying the snow? § 3 Responses to Snow White WIP#2"
Gee white on white must be pretty hard on your eyes! Sure that’s not contributing to your migraine? I’m sure it will be so amazing when it’s done. Can’t wait to see your Blythe, was it scary doing the carving? Did you use the dremel for that? I finally decided I must finish my shabby chic dollhouse and paint my nesting dolls this year. Being a perfectionist I find it so hard to start a project because I’m always so worried it won’t be perfect and to me if it’s not perfect it’s not worth even starting, ridiculous I know :o( I’ve really got to get out of that mind set! I love your shabby chic stuff you’ve posted before. I really hope you’ll finish both. The nesting dolls has really piqued my curiosity! 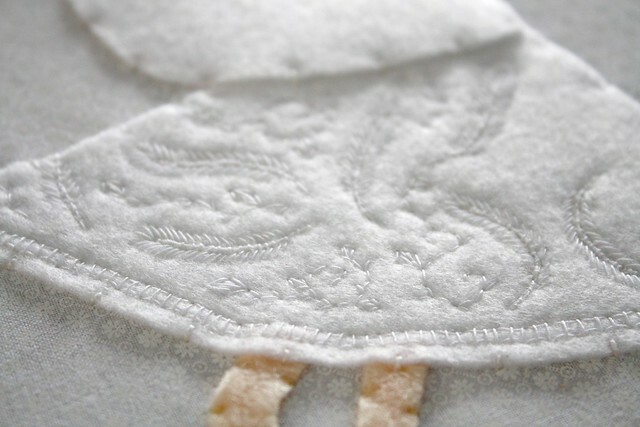 Oh I simply adore whitework! It’s going to be amazing once it’s complete!! Hmm, I’m working on a hat for a friend, and I’m -still- scribbling out the lesson things. You are currently reading Snow White WIP#2 at Sushi Candy.